"There are things in that paper that nobody knows but me, or ever will." 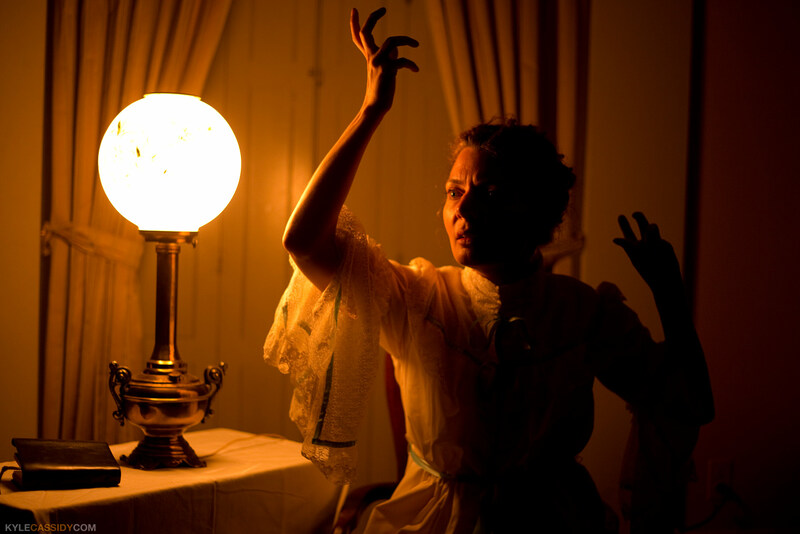 She performed this last year at the Physick House in Philadelphia and each show was sold out. (There's a review of that here. Since then, the production has gotten somewhat more complicated with additional lighting effects and surprises. The show lasts about an hour. It's a ghost story and the best way to see it is in an audience of a very few, so you can be close to the action. The House at Historic Waynesboro could have been the house from the story which is what makes it so much better than seeing it in an ordinary theater. It's far out in the country, isolated from everything. Clickenzee to get this big enough to be your computer wallpaper. The Yellow Wallpaper is the story of a woman imprisoned by her husband while suffering what at the time was called "hysteria". She's locked away in a horrid room in a beautiful house and kept from books and people and writing. When she begs her husband to end the "treatment" he takes her in her arms and calls her a "blessed little goose". At every corner she is ignored and diminished and stripped of any autonomy. While this is happening, things begin to manifest themselves in the room in which she's been kept, and strange things unfold. "There are things in that paper that nobody knows but me." So says the narrator in Charlotte Perkins Gilman's Victorian masterpiece, The Yellow Wallpaper. 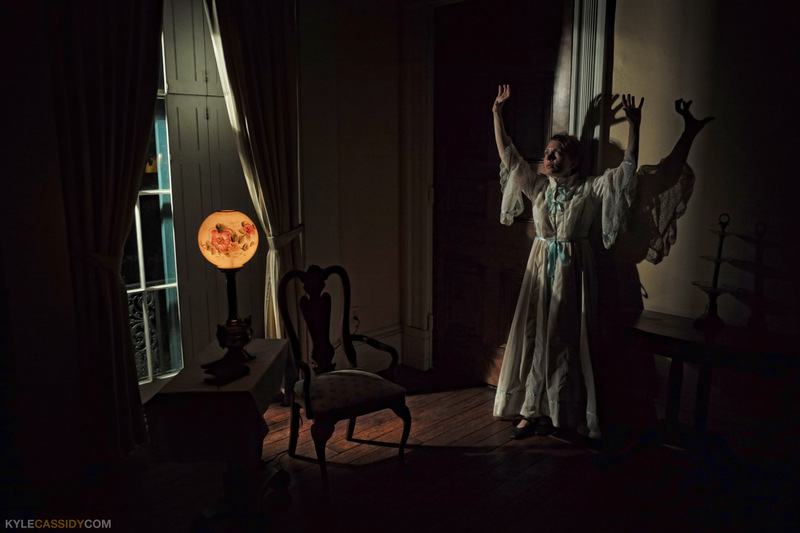 This tale of psychological terror and feminist awakening comes to life in the Carriage House at Historic Waynesborough, as a woman suffering from "nervous depression" is kept in the country on medical rest by her husband, only to discover that there is something far more insidious lurking within the walls of her prison-like room". Looked at in one way each breadth stands alone, the bloated curves and flourishes--a kind of "debased Romanesque" with delirium tremens--go waddling up and down in isolated columns of fatuity. -- But, on the other hand, they connect diagonally, and the sprawling outlines run off in great slanting waves of optic horror, like a lot of wallowing seaweeds in full chase. -- The whole thing goes horizontally, too, at least it seems so, and I exhaust myself in trying to distinguish the order of its going in that direction. The Yellow Wallpaper was written in 1892, but it's not any less important today. It's one of the early handclaps that lead to women's suffrage. I was happy to see such a glorious production in such a great space. The show opens Thursday November 16 and runs until the 18th. There aren't a lot of seats, so most of the shows will probably sell out so, getting your tickets ($22) in advance is a good idea. It's possible to get there from Philly on public transportation. There's a bit of a walk at the end, which should leave you good and terrified on the way home wondering if something has escaped from the Wallpaper and is ... somewhere ... behind you. Clickenzee to embiggen the mappen. What a brilliant story The Yellow Wallpaper is. Wish I could see the performance!